Today is my wedding Anniversary. My late wife Sunanda Gandhi continues to be a part of us as she lives in my heart and in our hearts. 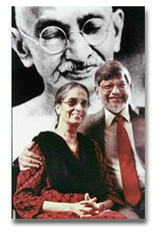 Prior, Sunanda and Arun, along with friends, organized India’s Center for Social Unity which developed self-help, economic models for India’s rural poor, assisting in breaking the cycle of poverty and keeping children at home and in school. Between 1985 and 1987, Sunanda helped edit The Suburban Echo, a news weekly from Bombay. Sunanda met Arun Gandhi while he was in the hospital. As a young nurse, Sunanda cared for Arun after surgery in India; a romance bloomed and their shared domestic life and work in nonviolence began. Sunanda Gandhi’s family were advocates of British rule and opposed to Gandhi, so the couple had many obstacles to overcome.